It's spring! (honestly. even if it is raining). & that means that it was my mum's birthday! (& also my sister's birthday and my lovely niece's birthday... although I wasn't on cake duty for them). 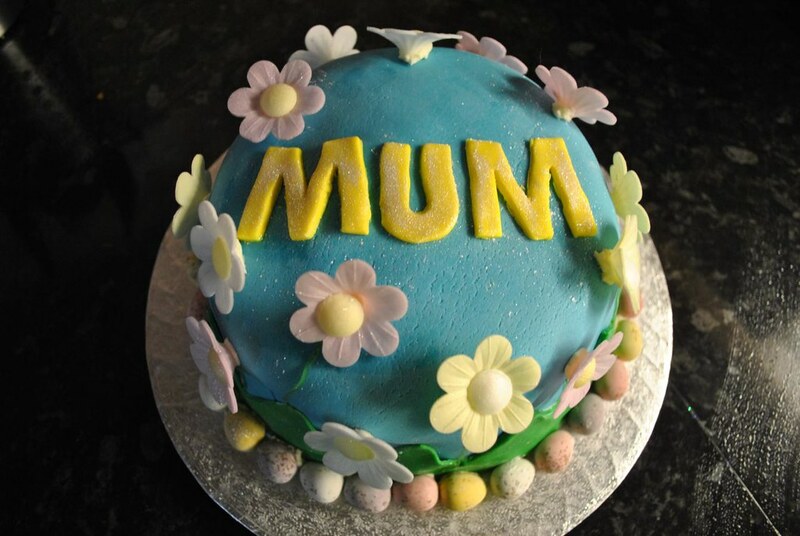 So, to celebrate, I made my mum a surprise cake. She's an amazing baker & has taught me all I know... and I am slowly but surely getting better at doing bigger cakes, but it means that the pressure is on to make it look good. I'm afraid I didn't take photos of the actual baking process (as I wasn't even thinking about starting a blog when I made it! ), but here's how I did it. First - bake the cake. I went for a simple vanilla sponge. Preheat your oven to about 180 degrees whilst you are getting the ingredients ready. Bung it all together. Start by mixing the butter & sugar until it's nicely smooth, then add flour, baking powder, & eggs. Start to mix this, pause to add in the milk, then keep going until most of the lumps are out. Be careful! It's better to have a mixture that is very slightly under-mixed and still has lots of air in it, rather than something that is super smooth, but won't rise at all. Grease & line your cake pan or pans and slop the mixture in. This recipe is great, cause you can play about with it however you want and it takes the rough handling well. I've used it to make cakes in sandwich pans and deep cake tins and both turned out great - just remember and adjust the baking time accordingly! Assuming you are going for a 7 inch deep cake pan - put it in the oven and set your timer for about 30 minutes. DO NOT OPEN THE OVEN DURING THIS TIME. RESIST THE TEMPTATION. After 30 minutes, have a look through your oven door. If it still looks pale on top then it's not even worth opening the door, just set your timer for another 10 minutes and come back. If it looks like it's colouring nicely then grab the sharpest knife you can, very quickly open the door & do the skewer test. Do not bring the cake out of the oven! Keep it on the shelf whilst doing this, and try and be as quick as possible. If the cake isn't ready & is suddenly cooled then it will sink, you will be sad, and nothing will save it. Protect it from the big, bad cold world. If the skewer/knife comes out clean and it bounces back nicely when (gently) pressed, then great! Get it out and leave it to cool for ages. If the skewer comes back with cake mixture on it, stick it back in, leave for ten minutes and then repeat. When the cake is nice and cool to the touch, start getting your decorations ready. For this cake, I made a big batch of buttercream (which was 500g icing sugar with 250g butter aka the best icing in the world). Cut the cake in half (again, assuming it was from a deep cake tin) and put a nice layer of buttercream and jam in the middle (use raspberry! it's the best!). Cover the whole thing in buttercream, starting on the sides, and finally smoothing over the top. I'll take photos of how to do this another time. Now, the fun bit! 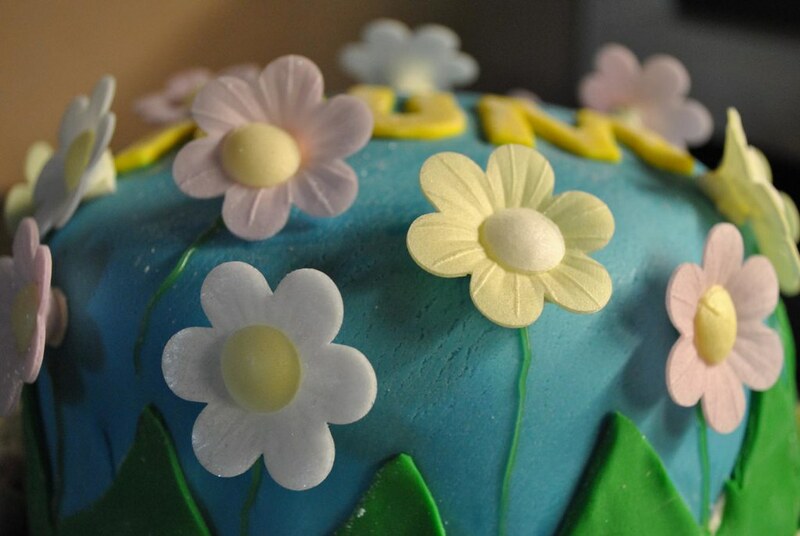 Roll out whatever fondant you want to use (I mixed dark blue and white to create the "sky") & gently cover the cake. I can't do this very well, but a bit of speed helps. I smooshed it down too much, and you can see the little cracks in the above picture (oh, the shame). Anyway, it's fine. Practice helps. Roll out a green strip, cut out triangles to make it spikey, and you have your "grass" which brilliantly is then glued (with buttercream) round the bottom of the cake, hiding the edge of the blue fondant. Stick on mini eggs to hide the edge of the green! Stick on wafer flowers (again, with a wee dab of buttercream) and try to place them evenly around the cake. This is another good opportunity to hide any cracks/marks on the blue fondant. Ice little stems with writing icing & give it a little dash of edible glitter to sparkle. 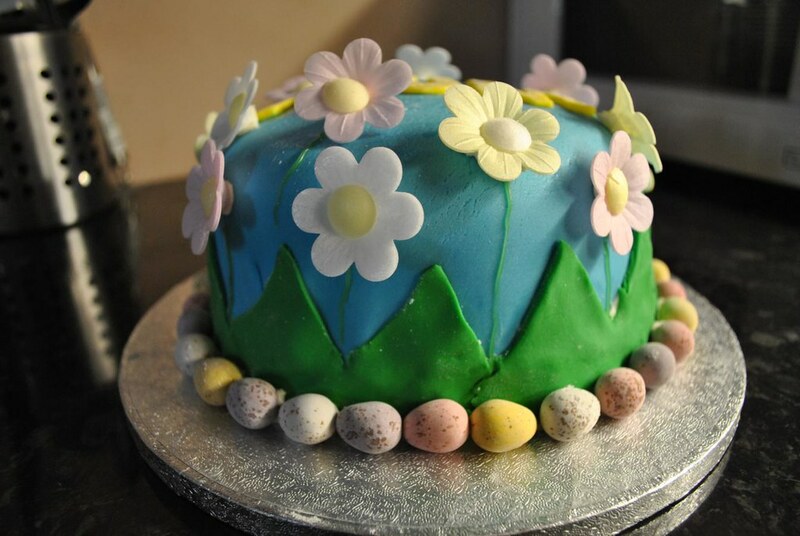 Tada, a spring cake! Everything (including the cake board) was bought in sainsburys cause I couldn't be bother walking to the cake shop in Edinburgh, so you don't even need to stress about buying fancy cake supplies. This would work pretty well for mother's day too, which is THIS SUNDAY (heads up). I just got linked over from LJ, the cake-decorating community. I had to comment how much I ADORE this cake! My mother's birthday is coming up and this gave me a lot of ideas. I use ready-made fondant (tried making my own before & it was a disaster!). For this cake I used Silver Spoon (http://www.silverspoon.co.uk/home/products/sugar-and-syrups-for-cooking/ready-to-roll-icing) & it was really good!